Washington honored its three senior golfers prior to a match Tuesday, Aug. 28, 2018 at the Greens. (l-r); Bre Taylor, Haley Hixson and Raven Haithcock. Washington senior Bre Taylor watches her shot during a match at the Greens Tuesday, Aug. 28, 2018. 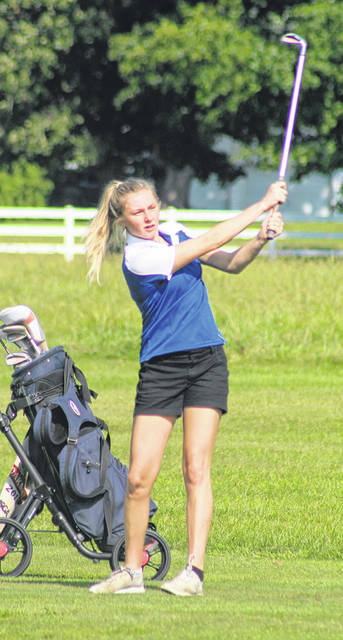 Miami Trace senior Meri Grace Carson on the course during a non-conference match at the Greens Tuesday, Aug. 28, 2018. Miami Trace’s Alyssa Butler putts from the fringe during a match at the Greens Tuesday, Aug. 28, 2018. Washington senior Haley Hixson executes a chip shot onto the green during a match at the Greens Tuesday, Aug. 28, 2018. 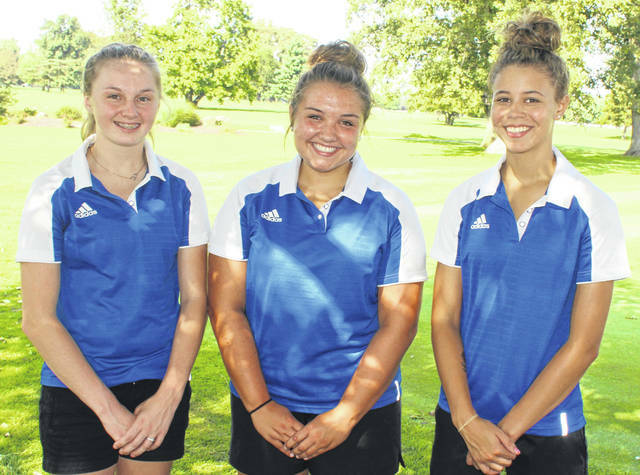 The Washington Lady Lions honored their trio of senior golfers prior to a non-conference match at the Greens Tuesday, Aug. 28. Seniors recognized were Raven Haithcock, Haley Hixson and Bre Taylor. McClain won with a team score of 208. Miami Trace had a team score of 233 and Washington posted a score of 267. Haithcock had the low score of 59 for Washington. Makayla Barnes and Alyssa Butler led Miami Trace, each with a 56. McClain’s Bri Weller was the match medalist with a 43. Other scores for Washington: Savannah Osborne, 62; Bre Taylor, 71; Haley Hixson, 75; Taylor Hixson, 76 and Eryne Croker, 78. 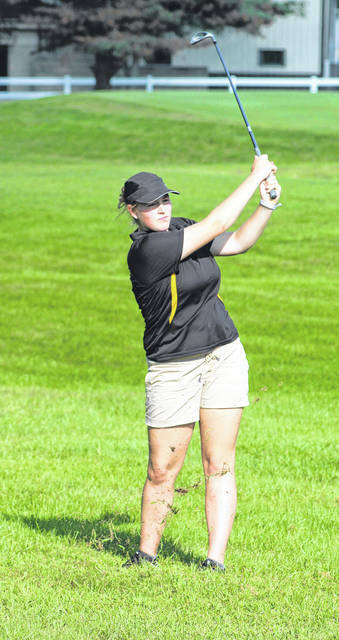 Other scores for Miami Trace: Libby Aleshire, 57; Meri Grace Carson, 64; Regan Hagler, 64; Destinee Butcher, 67. 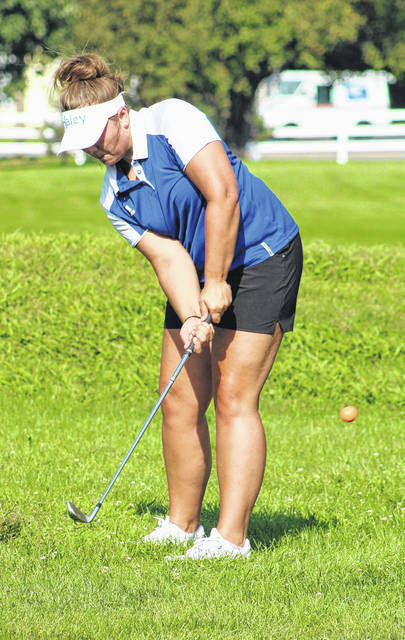 Other scores for McClain: Bryn Karnes, 52; Erika Martin, 54; Cassidy Willis, 59; Liz Kegley, 60; Shayna Beatty, 65. The Lady Tigers are 16-1 on the season and 9-0 in the Frontier Athletic Conference. Washington has a match scheduled for Sept. 12 against McClain at Buckeye Hills.